Computer architecture, programming languages, parallel computing, operating systems, energy-efficient computing. Molecular storage and computing. Luis Ceze, Professor, joined the Computer Science and Engineering faculty in 2007. 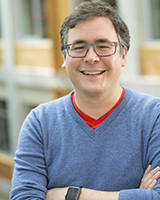 His research focuses on the intersection of computer architecture, programming languages (see the SAMPA research group) and molecular biology. He recently started exploring using biology to make better computers (see the MISL page). Visit his other other webpage. His CV is available here.